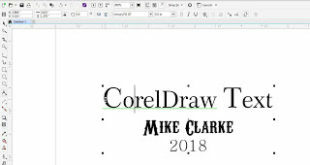 In this lesson we will look at how to set up a default workspace in CorelDraw X6. This is typically what I do for my computers. You may do it differently depending on your workflow and your likes and dislikes. 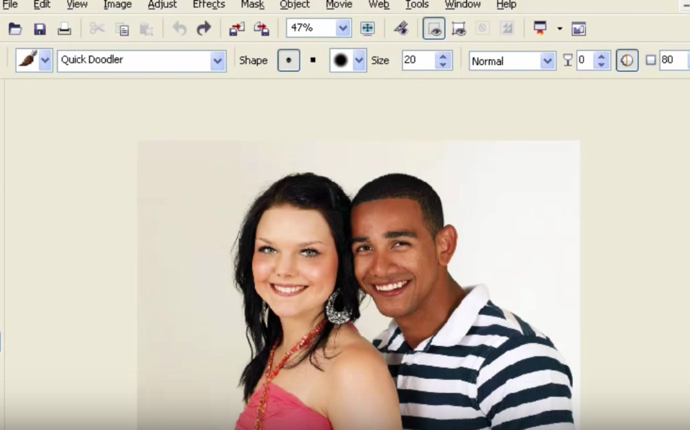 In X6 CorelDraw has introduced Style Sets which is where we make some of these changes. This is a departure from previous versions. 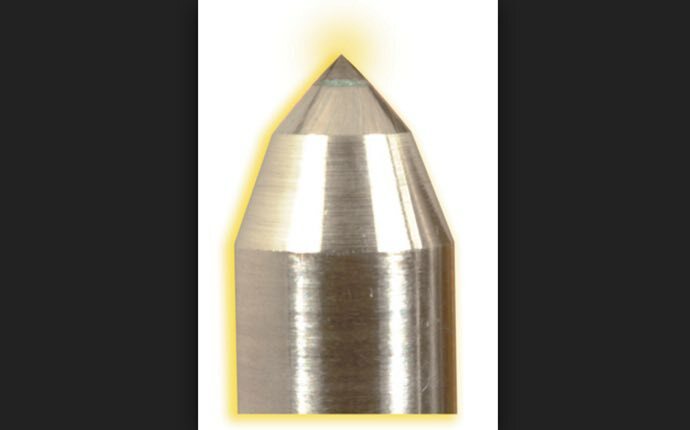 Also it is important that you make the changes in the default pen width so that it is set to hairline. 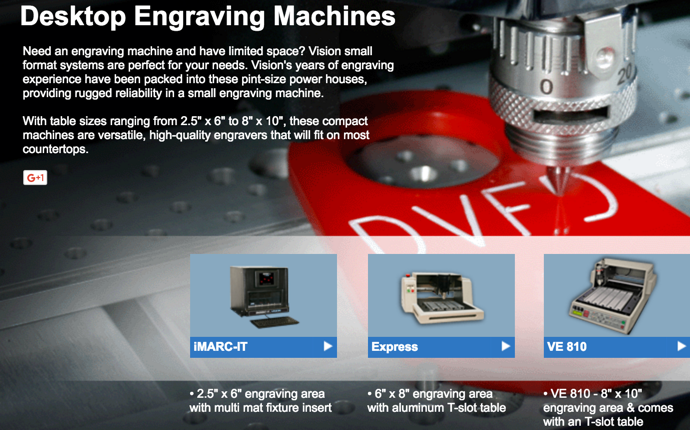 Thus when you draw a vector shape such as a rectangle it will cut on the laser. 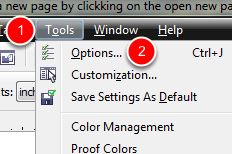 When you first open up CorelDraw you are presented with a default screen that gives you a number of options. Typically we want a new document to come up. First, I deselect the “Always shows the Welcome screen at launch”. 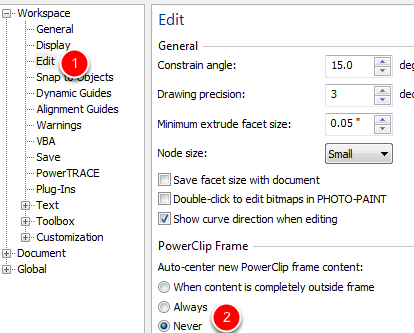 (1) Leave the “Make this the default Windows screen page” checked so a new document will always by default come up. This is the default page setup screen that comes up. Just click OK, we can make changes in another window. 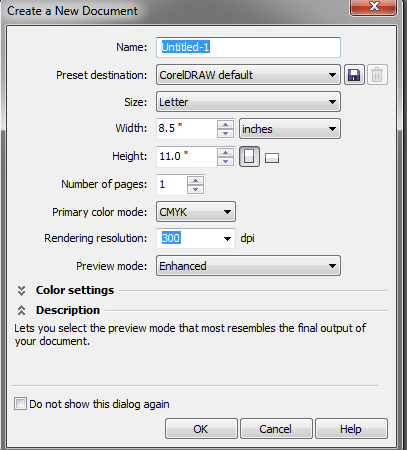 For the most part we need to be working in RGB not CMYK as is the default colour space for CorelDraw. Select TOOLS (1) COLOR MANAGEMENT (2) DEFAULT SETTINGS (3). 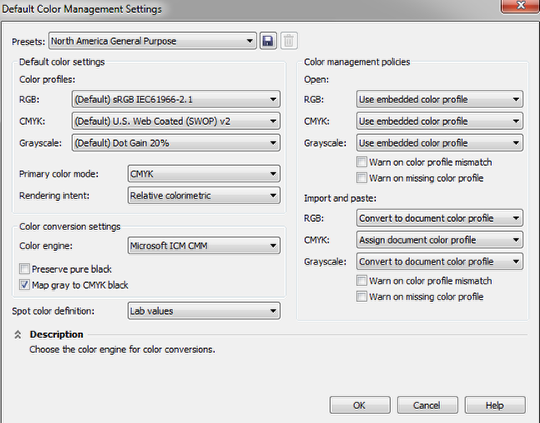 Here is the Default Colour Management Setup Screen. We need to make some changes in this dialogue box. First of all we should typically be working in RGB so make this change (1). Next we need to change the colour engine to None (2) Uncheck map to CMYK (3). 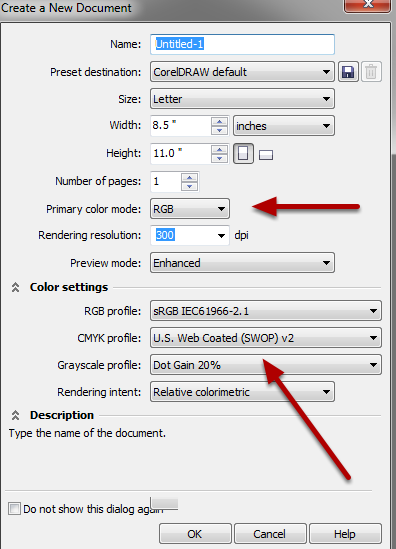 I change my spot color definition to to RGB (4). The first 4 are for Laser people. The next 4 are for sublimation users. 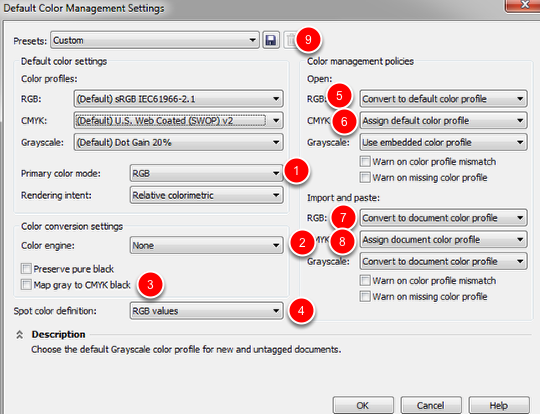 For opening jobs I change RGB color space jobs to default color profile (5). 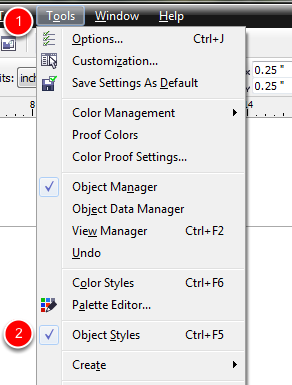 For CMYK I use Assign Default Color Profile (6). Import and Paste I leave as they are (7) (8). If you want to use different setups for different devices you can choose to save the Preset and give it a name (9). 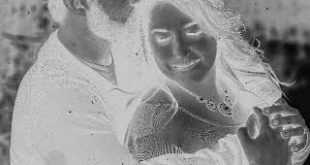 I have saved the preset color space as Laser (1). Click OK to save it. 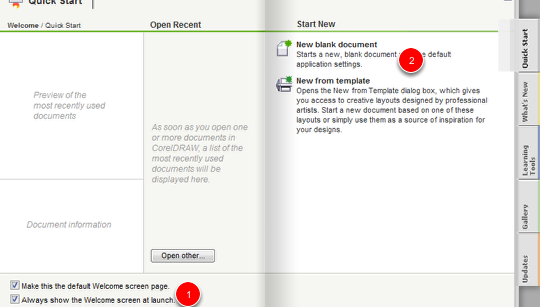 Close that page down and reopen a new page by clicking on the open new pave Icon. Notice now the Primary Color mode is RGB. If you leave your mouse over one of the color swatches you will see that my colour docker is not CYMK anymore put RGB. 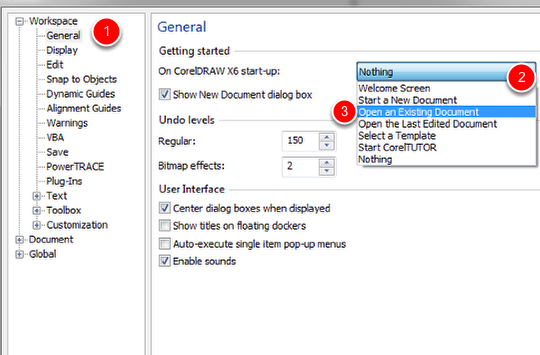 The first step I do is to change the way that CorelDraw opens a document when we first start up or create a new page. 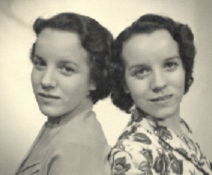 Click on General (1). This displays up the following dialogue box. Click on the pull down menu (2). 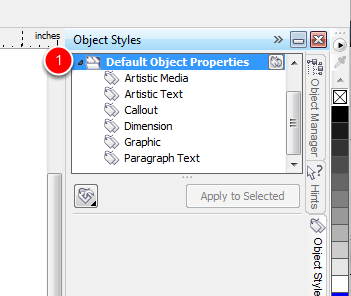 Select “Open an Existing Document” (3). Next we need to change our Powerclip setting. Select Edit (1). Next, select “Never” (2). 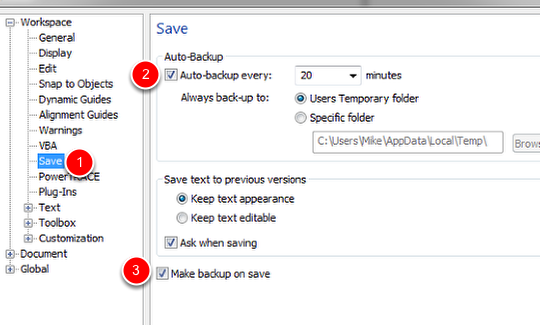 A couple of things I like to do is to do away with auto backups and making a backup on save. 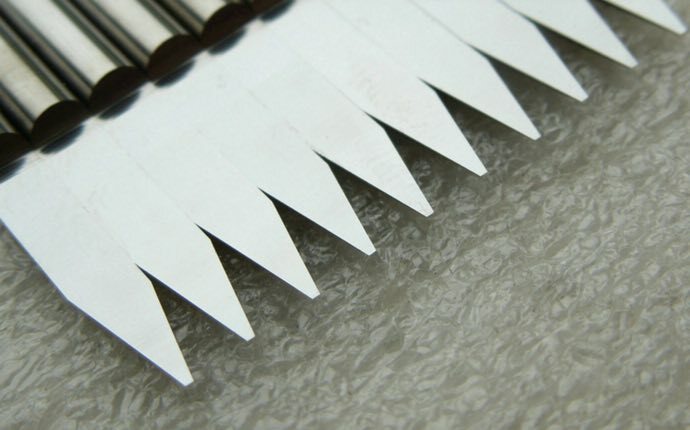 Select Save on our right hand panel (1). Next Uncheck the AutoBackUp (2). 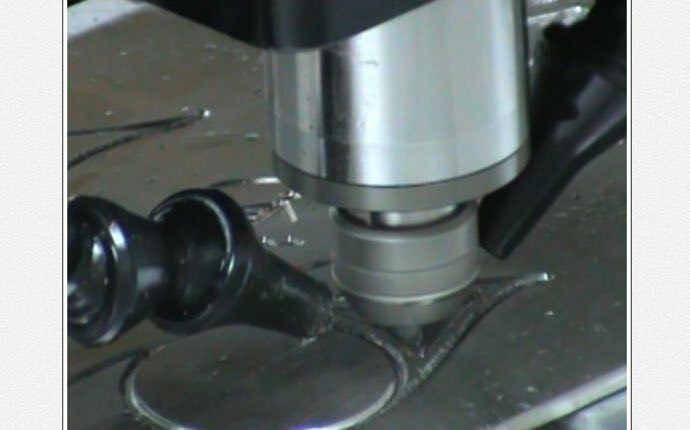 This will stop auto backups from happening. Ok, I know windows is crap, but it is a lot better than before. Also, I hate having backup files of the files I saved. That is why I save them. Uncheck this (3). This will get rid of all the backup files that are saved when you save an image. 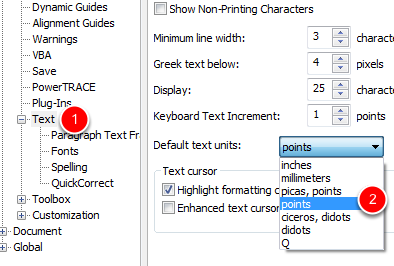 Change our text to inches from points. I like to work in inches so I a happy to change away from points. Go to Text (1) and select inches (2) in the pull down menu. The other thing you may want to do is to change your menu bars. Note: if you lose a menu bar this is one way of getting it back. 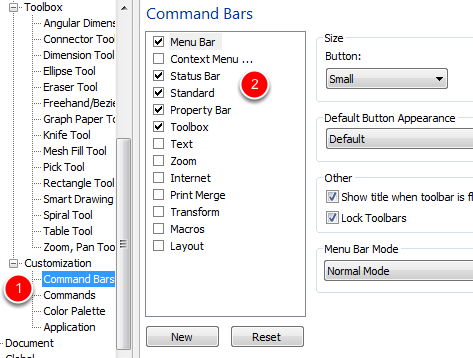 Select Command Bars (1) and select the menu bars that you want (2). Note: any changes in this section require us only to click on the Ok button and exit. 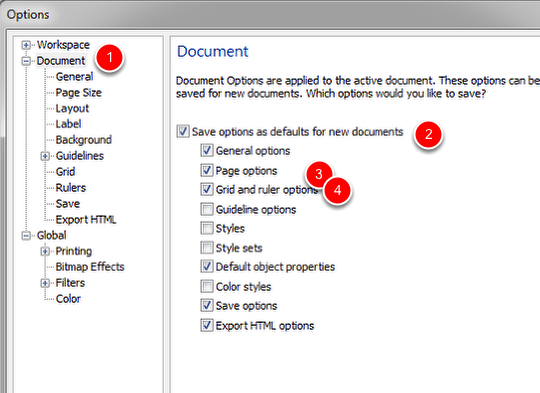 The next section in the Document section requires us to save the settings with our Save setting the Document section. 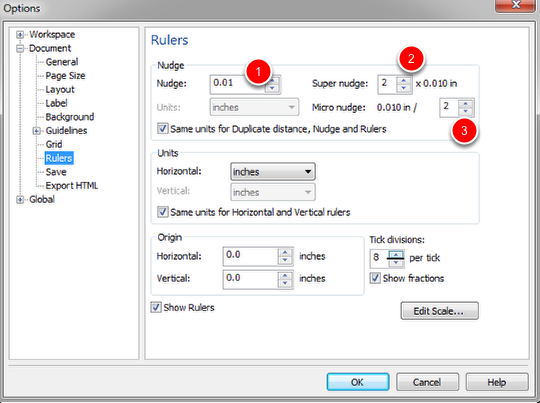 Once you create a custom size you can then access the page size in the pull down menu from the Property bar in CorelDraw. Notice I have a 12 by 24 and a 5 by 7 size in the pull down menu. I could add a number of other page sizes. The one thing that you may want to change is the Nudge setting. When you press the arrow keys on your keyboard you are moving or nudging the object by the value that appears in this section. By holding down the Ctrl key or shift key you can get either a micro nudge or a super nudge. Once you are done, click on the Document in the left hand pane (1). 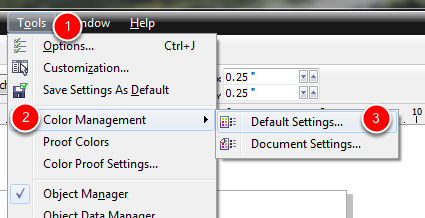 To make your settings permanent check the “Save options as defaults for new documents” (2). 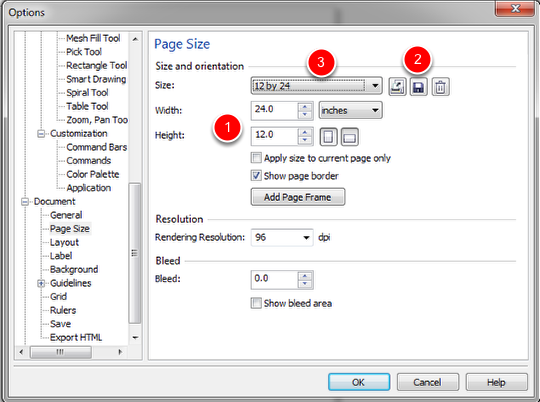 Check any of the changes that you have made such as Page Options (3) we made changes to the page size and Ruler Options (4). 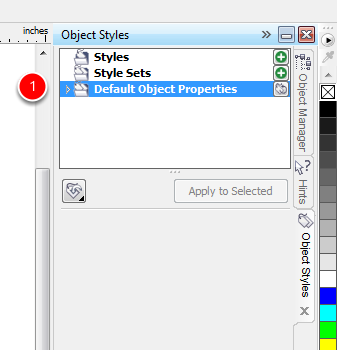 Go to TOOLS (1) | OBJECT STYLES (2). 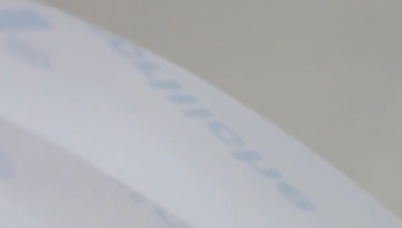 Select the Artistic Text Object (1). Now you can change any of the attributes for the font (2). You can change your font height (3). Make your Text Center Justified (4). 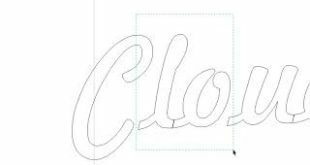 To make sure that our vector lines cut we need to set them to hairline. I like to keep this as a default so we can change this. 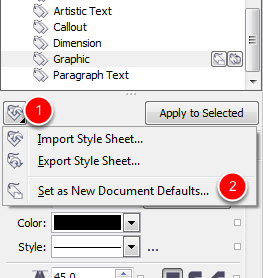 in the Graphic characteristics..
To make your text and graphic characteristic a default, select the Style Sheet Flyout (1). 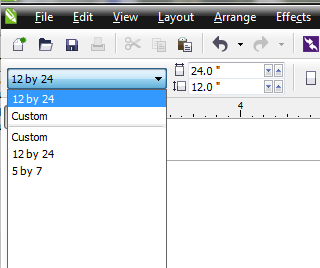 Next, select Set as New Document Defaults (2). This will make these value changes default. These are typically the changes that I do to my system when I first install CorelDraw. Finally, someone who know what they are talking about. 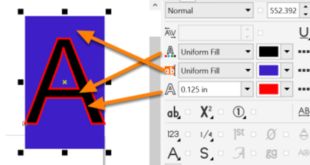 I have been searching for so long for the answer of how to change my default artistic font. Everyone else give instruction on the way it used to be. 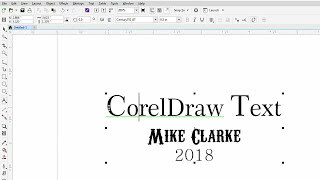 For some reason, they changed it on CorelDraw x6. So, frustrating. Thank you so much.